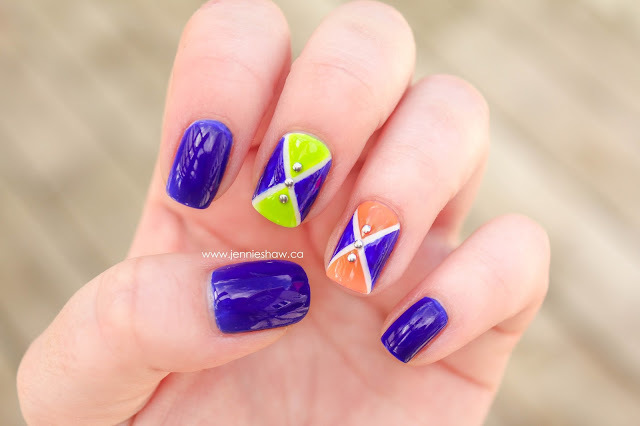 It's week three of Neon Month, here on the nail files, and I happily used it as an excuse to get some more nail polish. Because a girl can never have enough neon polishes (or glitter polishes...OMG, maybe that can be next month's theme! Haha!). Anyway, Sally's was having a BTGO sale, so I picked up two bottles from the new ORLY Adrenaline Collection: On the Edge and Thrill Seeker. Side Note: I don't know what's been going on at ORLY headquarters this year, but I've basically loved every collection they've put out. So keep it up, people! As usual, these neons were really hard to photograph. I had to crank down the lighting for the orange but it still came out super muted. In real life, Mayhem Mentality is off-the-charts bright. 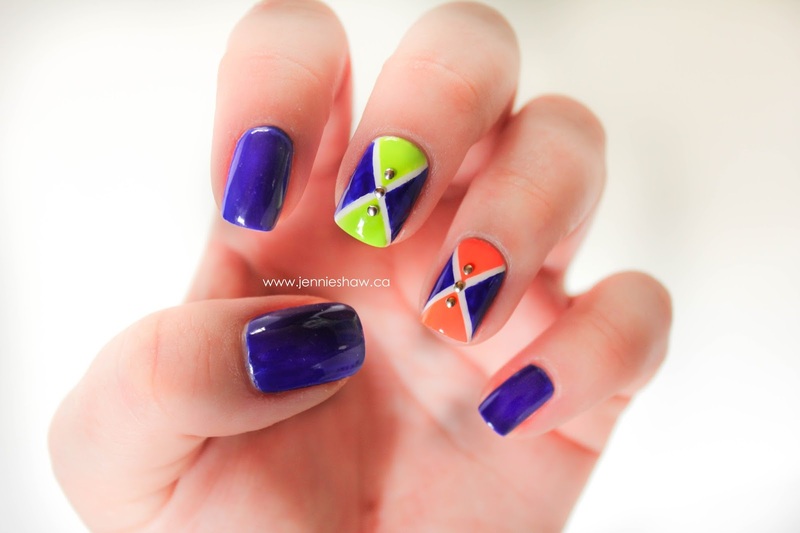 To start, I did two coats of White Tips on each nail, so the neons could really pop. When my nails were dry, I added two pieces of striping tape to my middle and ring finger, crossing them in the centre (as you can tell from my ring finger, my lines were a little skewed *headdesk*). 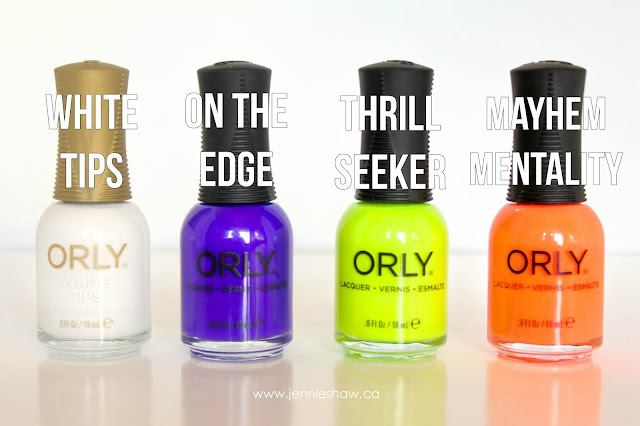 Then I did two quick coats of each colour: Thrill Seeker, Mayhem Mentality, and On the Edge. Natural light was even worse for Mayhem Mentality, as it came out looking peach. PEACH! How?!? It's not even almost a little bit peach-like! *grumbles* However, with that said, this is the most accurate picture of what On the Edge looks like. So at least there's that. Haha! Before the polish could dry completely, I removed the strips and patted down the edges that stood up. While that was drying, I did two coats of On the Edge on my pinky, pointer, and thumb. To finish it off, because it still wasn't quite right, I added three small silver studs to my feature fingers, and then topped each nail with one coat of Glisten and Glow's HK Girl Top Coat. I'm so sad that these pictures don't do this mani proud. The neon green and orange is crazypants bright, but you only get a taste of it, here. On the Edge is a seriously beautiful, hyper-pigmented blurple, and it's definitely going to get some use because I love me some blurples. Haha! As to White Tips, this was my first time using a white other than Fingerpaints Paper Mache and I think it's pretty good! The formula was thick enough that I got good coverage in two coats and I think that if I'm really careful with my application, I could even get away with one. Yay for Sally's sales, which gave me this polish for free! In my experience, it's good to get free products to try first, just in case I don't like it. Because I'm cheap like that. Haha! There's only one week left for Neon Month, so if you haven't played around with the brightest colours in your collection, there's still time! But even if you're not into the theme, you can absolutely still link up your post. The more nail polish, the better! I have never try orly nail polish out before. You nails look fantastic. Have a great weekend. I have purple on this week too. That is a cute look. I don't use orange or yellow often.